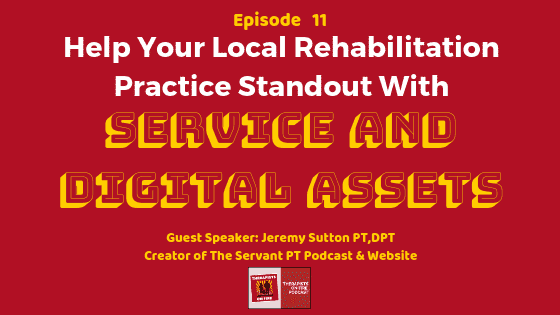 Episode 11: Dr. Jeremy Sutton PT,DPT shares his knowledge and experience about how to help your local rehabilitation practice standout from the crowd with quality service and digital assets! Dr. Jeremy Sutton PT,DPT is a private practice owner. To help him stand out in his local market, he has created a series of digital assets including a book, an online course, and a podcast. These assets are helping him connect with other healthcare practitioners and as result, help him grow his referral rate. These assets are also helping him grow his authority to serve more patients and stand out compared to other rehabilitation practices. We can only treat so many people in a day. So he created an online course which he launched with local businesses. To reach more people, he realized he needed to create a book! 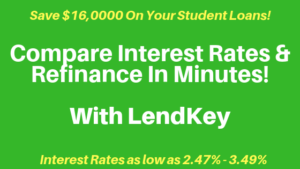 He repurposed his online course into an book almost overnight! He simply sat down and typed as he listened to his online course. Eight hours later, he was a self published author on Amazon! He now gives his book to his patient’s. This creates instant authority and helps him standout in his local network as he basically the only self published therapist in his town! He uses his book to network more authentically and organically. His number and email is in the book so others can contact him if interested. He’s planning on printing his books and handing out to local clinics and physician offices to further improve referral rates and improve his patient’s knowledge of neck pain. Get reviews! The more reviews you have on Amazon the higher you will rank on Amazon. It will also help you pop up in the search engines easier! 10:50 Jeremy’s podcast: The Servant PT Podcast and how this podcast helps connect his clinic to other healthcare professionals including nurse practitioners, chiropractors, physicians and many others. The Servant PT Podcast enables Jeremy to be able to connect on a more personal environment with fellow healthcare professionals. This connection will enable more referrals to his clinic and these referrals will be more consistent as well, because it’s built on a more personal level. 17:00 Anyone can build these digital assets! Simply take a couple courses and start fiddling! -Jeremy started his physical therapy through buying a pre-established clinic. His clinic was near a hospital which was his main referral source. Unfortunately, shortly after, that hospital started their own outpatient practice and this is what inspired Jeremy to separate himself from others. Yes, you can separate yourself through additional skills and certifications. But social media and marketing plays a huge role in attracting new buisness and this has been very successfull for Jeremy so far! He simply has a short video that says he’s proud of you and that he loves you. He runs this advertisement on Facebook. This sense of caring and service attitude has drawn so many people to his clinic and is unique compared to many other advertisements out there. If you are the only person on Facebook talking about your topic, then you become an instant authority and stand out in the crowd! You can easily get Google Alerts which you have trigger alerts for you for your name, buisness, or other digital assets. And its 100% free!! 26:48 One thing Jeremy wishes he could change. Jeremy bought a pre-owned and established practice. 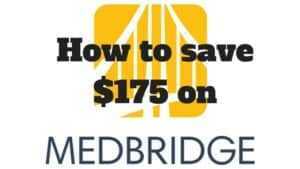 If he could do it over again, he would have spent more time researching how to buy a practice. He wishes he would have simply invested only $500 – $1000 and started his own buisness instead. Even when you buy an established practice, you still have to almost start over because that therapist was the practice! 29:20 Jeremy’s best advice and best experience during his journey as a practice owner. Want to listen to the podcast? It’s easy, just search “Therapists On Fire” on any media player!